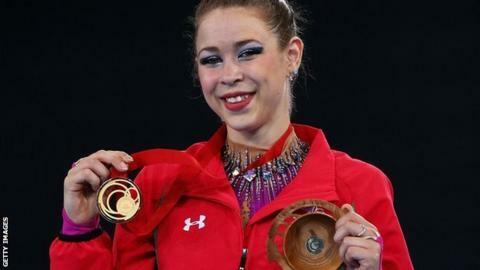 Former rhythmic gymnast Frankie Jones, who won gold at Glasgow 2014, has been appointed athlete adviser to the Commonwealth Games Wales board until 2018. Jones will offer advice on how Welsh athletes can succeed at the Gold Coast Games in four years' time. The 24-year-old, who won the David Dixon award in Glasgow after winning six medals, was runner-up in BBC Cymru Wales Sports Personality 2014. "I am proud and honoured," said Jones. "During my competitive career, I have had the honour of representing Wales at three consecutive games. "I can honestly say they are the competitions that hold the strongest and most amazing memories of my 18 years of participation in gymnastics. "Being athletes adviser will allow me to continue to inspire younger athletes to follow in my footsteps, overcome adversity and win for Wales." Jones led the way in the medal haul for Wales in Glasgow, helping the team to a record-breaking 36 medals.